I try to integrate Subversion with IDEA v5.1 and Demetra 5175 but when I check out project from Subversion, in Project pane it still shows _svn folder. I think it should be hidden, same as CVS folder in CVS. Microsoft product which couldn't handle dots in directory names. I don't think so. 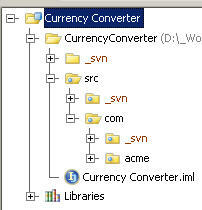 'Cause in Modules dialog, at Paths tab, IDEA doesn't show these folders (_svn). I think it's a bug in Windows version. show these folders (_svn). I think it's a bug in Windows version. to be re-checked-out to get "_svn" instead. Maxim, thanks a lot. It works!